Sunday on the Network: Murse! 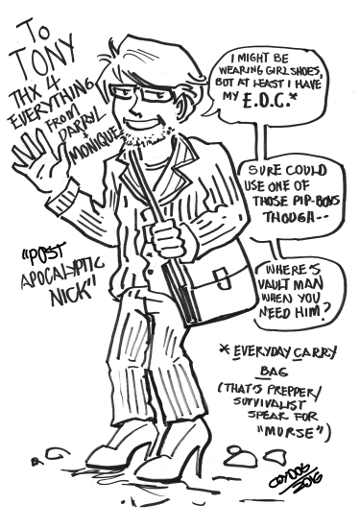 Monique, over at Xcelsior Online, drew this awesome pin up of Post Apocalyptic Nick! Thanks Monique! Monique and Darryl have just be so nice helping me vote each other’s links up in Stumbleupon. Today at Super Frat, it’s Your Fratoscope for October 16, 2016. Oh, and don’t forget, we have a Patreon.